Leh has been on my bucket list since Sep-2011 when I was supposed to travel with my friends but never happened as I couldn’t get 10 days of leave from work. The best period to visit is from June to October, as I missed then, I had to wait for one whole year to travel. Seek a different group who would be ready to go around the same time as me, request for leaves, make sure it doesn’t clash with other engagements etc. which resulted in many postponements and finally happened in July 2014 (better late than never ) and inspired me to blog! It all started, rather restarted (remember it was cancelled the first time) when I came across this travel company called Beautiful Journey on Facebook. I was intrigued by the idea of an all women travel group, for women by women. More than that, I had found a group to go with, who would make all the necessary arrangements. Convenient isn’t it? I really didn’t have the time and patience to plan a holiday myself, form a group, convince people, convince their folks, get approvals, make sure everything is well planned; nobody wants a bad memory out of a holiday, you see. So instead of me taking all the responsibility, I thought I better go on a planned trip and just relax because all I wanted after six months of continuous slogging at work was a break! The scheduled travel date for my much-awaited trip was 6 July 2014. I was done with registering for the trip and booking my flight tickets by mid-May 2014. The travel group kept us well-informed about who will be travelling with us, where do we meet, where do we stay, the itinerary and all other necessary information, so there was not much to bother. On the 6th day of the month of July, after packing and repacking multiple times, we were ready to fly to Delhi from Bengaluru, where we would meet the rest of the group. My friend and I took an evening flight to New Delhi, the plan was to stay at the airport overnight as the next flight to Leh, the following morning was as early as 5 AM. We thought that was a better idea than finding a hotel or sleepover at a friend’s and get back to the airport in the wee hours. That would save us a lot of travel time, to and from the airport. Also, we thought it was safer there than any other place on our own. A little on the group, with whom I spent an entire week – we were a group of 18 ladies of different age groups. Most of them were of my age, few a year or two younger than me and around 4 or 5 women who were much older than me, but young at heart, no doubt. The majority of us were from Bengaluru rest were from Mumbai, Pune, Delhi, and Kochin. I was mesmerised, kept looking out of the window and clicked many photographs, just wanted to capture all the beauty. Honestly, it’s a moment no camera could have captured, an indelible memory I will carry with me for long. 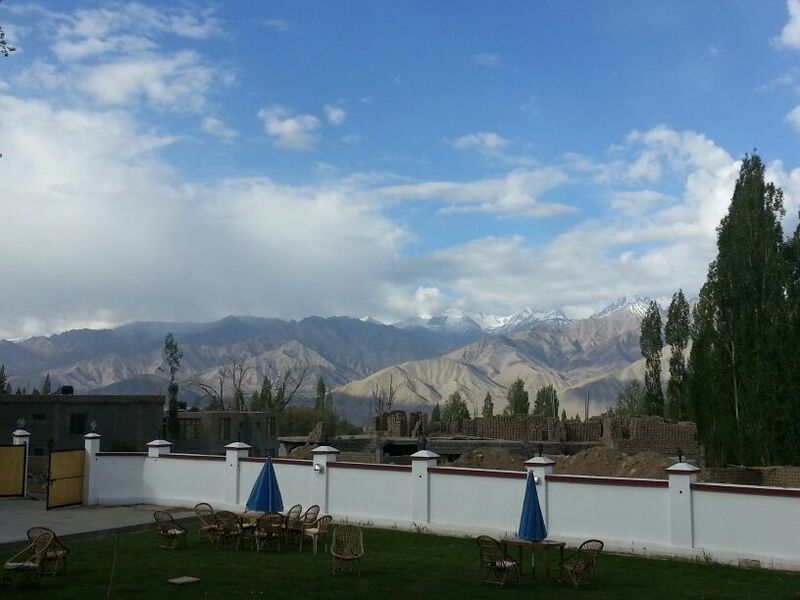 Initially, we saw green mountains, then the snow-clad mountains and lastly the sedimentary rock mountains of Leh. We landed in Leh’s Kushok Bakula Rinpoche Airport, which is a defence airport after an hour. The airport was one of the smallest that I have ever landed on. It has a short runway, and landing was thrilling (read scary). We got out of the airport to find our chauffeurs ready to drive us to our hotels. I was surprised to learn that Leh roads have no traffic lights! It took us less than 15 minutes to reach our hotel. Hotels in Leh were not more than 3-4 storeys tall. They had all the essential amenities for a comfortable stay. The hotel itself looked charming, with ornately carved wooden window panes and polished wooden floors. A colourful lobby with local art painted on the walls. The staffs were very hospitable. I found the Ladakhi folks to be very courteous and humble. At the hotel, we were received by a local trip organiser who briefed us about acclimatization. Leh being at an altitude of over 3,500m, getting used to the altitude is extremely important. She strictly told us to drink a lot of fluids, not have a bath, and bare minimal physical activity on day 1 is the best thing. She also suggested popping in a Diamox which helps in high altitude sickness. I had consulted my family physicians before the travel and had carried medicines prescribed by him. I was told I could manage without a Diamox, so I didn’t take one. Surprisingly, I felt very normal. I am the kind of person who obeys orders. I was told not to take a bath and rest the entire day, and I obeyed. I just got fresh and ate my breakfast and took short walks on the balcony. Few others who didn’t obey what our trip organiser suggested, and went ahead and bathed and ran up and down the stairs, felt giddy and even threw up. These terrains deserve a lot of respect. All I did on day 1 was sleep, watch television, click pictures from the balcony and sit in the sun when I felt cold. Airtel postpaid reception was excellent in and around Leh, and I didn’t feel disconnected at all. Heard BSNL also works best there. The weather was warm with the sharp sun shining bright on us, but the cold wind from the snow mountains kept the temperature low. This was the view from the balcony. In the evening we went out for dinner. We dined at a local restaurant called Chopsticks (which was the best out of all the restaurants I had been to in Leh) I ate Thukpa, a Tibetan noodle soup which was filling and yum. We had also ordered for fried rice and momo which was tasty. By this time, mountain sickness started to creep in. The temperature was somewhere around 9-degree centigrade, I think. I started shivering with cold, despite wearing warm clothes and a throbbing head to top it all. I took a painkiller for a headache, drank hot water and went to bed. I was feeling much better the next morning and was all set to explore Leh. 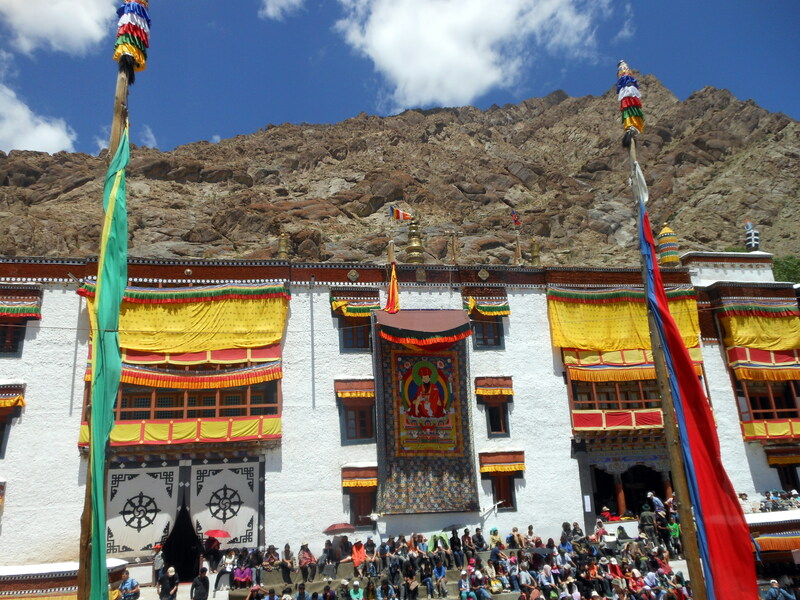 Day 2 (8 July 2014): We started off with visiting Hemis monastery where the annual festival was held. A typical monastery will have many prayer wheels which have to be rotated clockwise, a statue of Buddha and many stupas. Hemis was all decked up for the festival with the Thangka unrolled against a wall. Thangka is a painting on cotton or silk depicting Buddha, to be unrolled for religious occasions. 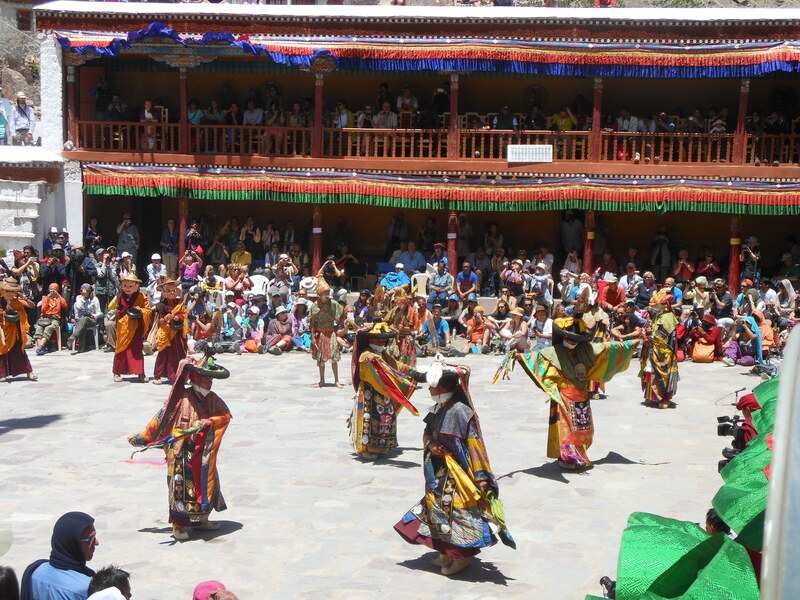 A traditional dance was performed by masked Monks in the courtyard, dancing to the tune of drums, trumpets, and cymbals. The dance symbolises the triumph of good over evil. After Hemis, we headed to Thiksey Monastery which houses a two-storeys tall statue of Maitreya Buddha and White Tara (female Buddha). Apart from the tall statue of Buddha, the monastery had the typical architecture, steep steps, stupas, prayer wheels and prayer flags. 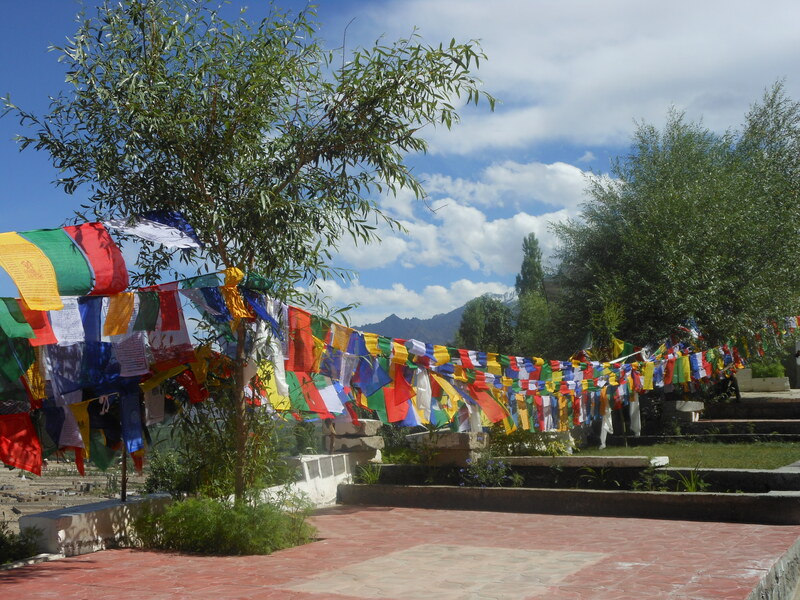 Prayer flags (prayers written on cloth banners) can be seen almost everywhere in the region of Ladakh, but I think the most beautiful ones were found in Thiksey. After Thiksey we headed to Shey Palace. Shey is located on a hillock, and we had to trek steep steps to reach the monastery which houses a giant copper statue of Buddha, rising to a height of three storeys. 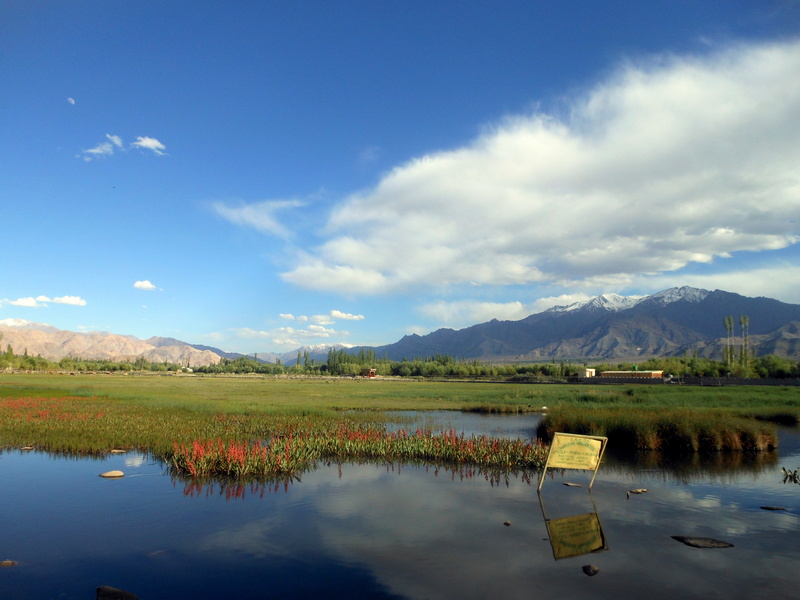 I found the Holy Fish Pond facing Shey Palace more beautiful than the monastery itself. Apparently, one can see the reflection of Shey Palace in the pond. Next up, we stopped for a short while by the beautiful river bank of Sindhu, also known as Indus. From Sindhu Ghaat we headed towards Shanthi Stupa, before calling it a day. Shanthi Stupa is located on the hilltop of Changspa. It was built by the Japanese to promote world peace. We visited the cafe on the premises of the Stupa and hogged on Maggi and Shahi Kahwah (Kashmiri Tea). We returned to our hotel for overnight stay before the big day. 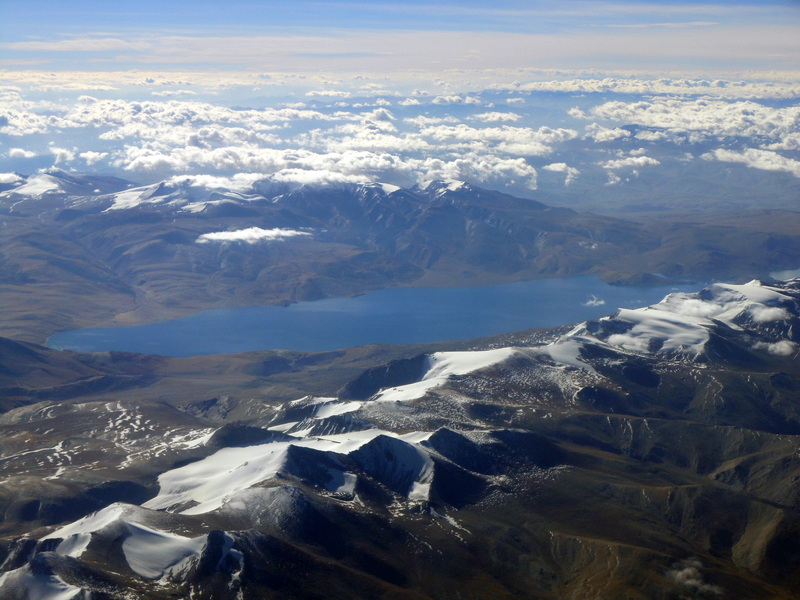 Day 3 (9 July 2014): Out of all the places listed in the itinerary, the one I was looking forward to (with bated breath ) was the world-famous Pangong Tso also referred to as Pangong Lake. We were told it’s a 280 km round trip and thus started very early in the morning around 6:30. 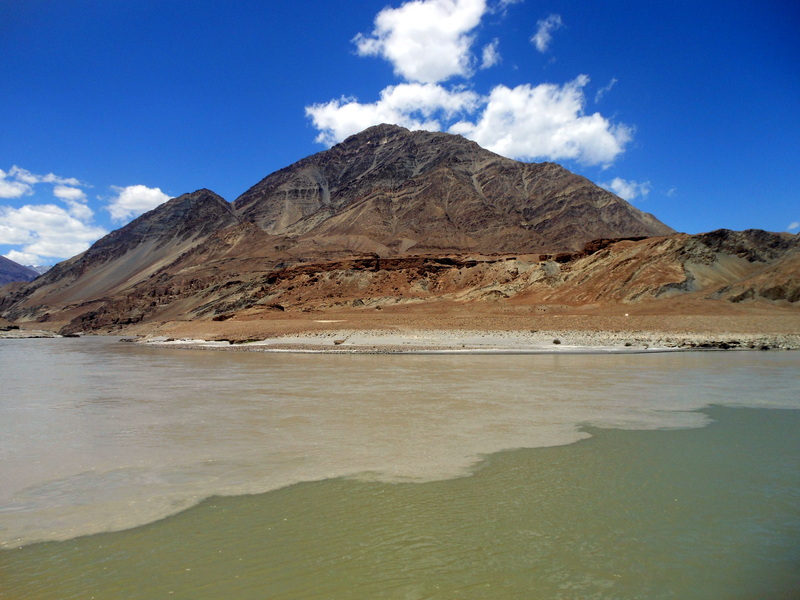 To reach Pangong, we have to cross Chang La. Chang La is a mountain pass at an altitude of around 17000 ft which makes it the third highest motorable road in the world! We have to ascend the mountain, cross Chang La and descend to reach the lake. En route to Pangong, we had stopped for breakfast (we had packed food from the hotel), we could see a trickling stream, clicked some pictures and continued our journey. As we ascended, I could observe the changes in my breathing. I was short of breath. Shallow breathing gave me a sharp headache. Many in the group felt dizzy and nauseous. One should not stop for more than 15 minutes at the pass. That was one scary pass I must say. A big salute to the Indian Army soldiers deployed at the pass. My respect for them grew 100 fold. Pangong Lake is in disputed territory. The line of control passes through the lake. Only one-third of it lies in India and the rest in China (lucky Chinese ). The water was ice-cold, crystal clear and the rays of sunlight shining through the clouds create an illusion of water in the lake changing colours from aqua-blue to turquoise. We could see gulls over and on the lake surface. Captured many photographs, still couldn’t satiate my hunger for more. By then we were hungry for food and ate lunch by the lake before we started our journey back to Leh. This time I was prepared for the long and tiring journey back to Leh. I popped in a pain-killer for my throbbing head. Drank a lot of water and slept for the most part of the trip. We could see the glaciers melting in the sharp sun on our way back. I was all right for the rest of the evening. However, Chang La gave few of my fellow travellers a hard time. One was even put on an oxygen mask. She felt better after two hours of oxygen supply, we took her to a hospital soon after reaching Leh and got her admitted just to be sure she is fine. She was put on saline, and we were told she’ll be under observation the entire night and discharged the following morning. The rest of us went back to the hotel to get proper rest after an adventurous day. 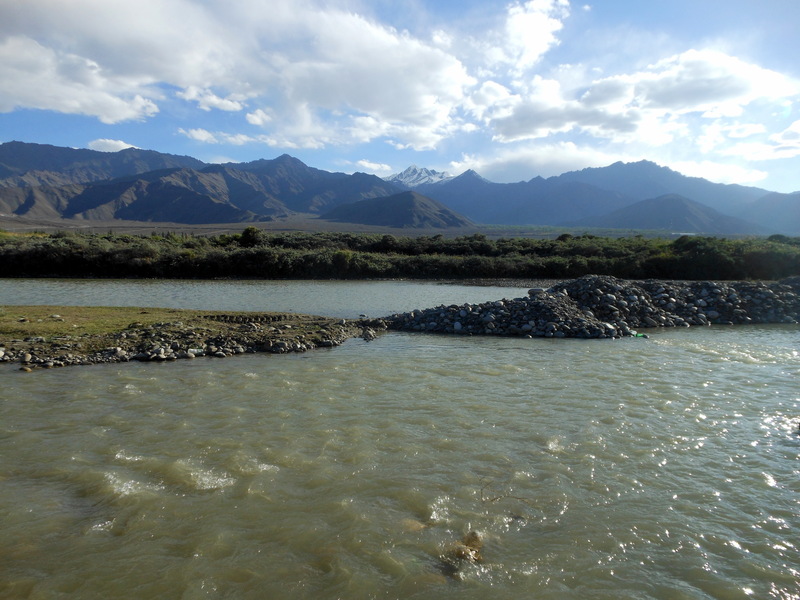 Day 4 (10 July 2014) – After a good night’s sleep, I was feeling fresh and charged up to explore Leh. According to the itinerary, we were supposed to drive up to Khardung La but postponed that to Day 5, as most of us were exhausted (and scared of altitude sickness) after the visit to Pangong. We got a few more hours lie in and left for the Sangam at around 9:30 AM. From thence we proceeded to Gurudwara Pathar Sahib. En route we stopped at the magnetic hills only to pose for pictures and not to experience any phenomenon The hill is mistakenly characterised as having magnetic properties which are strong enough to pull cars uphill. We saw a few motorists testing this phenomenon, but nothing really happened. Our next stop was Spituk Gompa, another monastery and a Kali Mata temple adjoining the monastery. We didn’t stay there for long as all the Lamas (monks) were at the Kalachakra ceremony and the monastery was closed. The 34th Kalachakra ceremony was held in Leh during our time of visit. The speciality of this ceremony is, His Holiness the Dalai Lama along with the monks conduct rituals and give preliminary teachings. Few ladies from our group went to the festival on the fifth day of our tour. I didn’t. With all due respect to His Holiness the Dalai Lama, the whole idea of sitting in the hot sun, and seeing him on a projector screen whilst listening to the Hindi/ English translation of his preaching on the radio didn’t impress me, I thought K-top was a better option. We drove up to the Hall of Fame from the monastery. 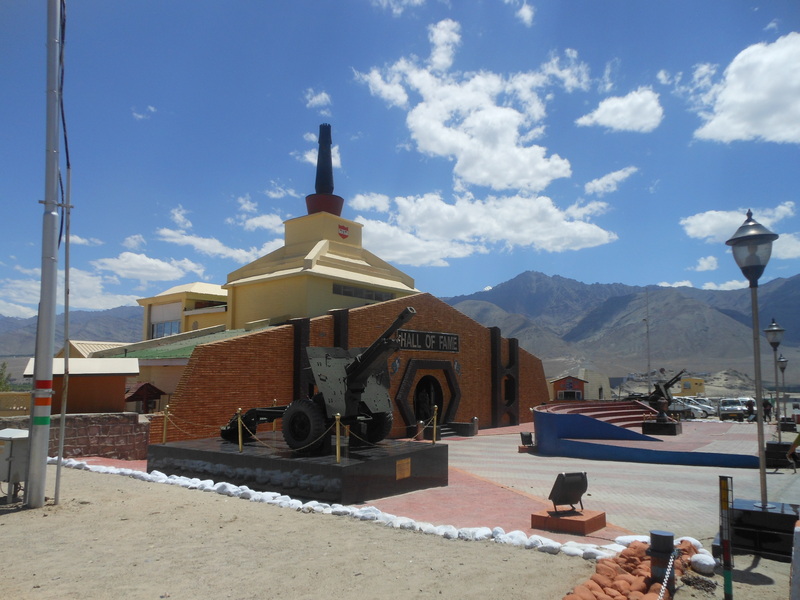 The Hall of Fame is a museum constructed and maintained by the Indian army in memory of the brave soldiers who lost their lives in the Indo-Pak wars. It has on display, some of the weapons captured during the war, pictures of the martyrs and their inspiring messages. Great place to observe and absorb the details of the war, life of the army personnel and difficulties of the battle. There is also a souvenir shop in the museum where Pashmina shawls were sold for a much lesser price as compared to the market. We went to Chopsticks (my fav restaurant in Leh) again for lunch. Post lunch we went to Leh Palace. Leh Palace, though in ruins still attracts tourists. It is maintained by Archaeological Survey of India. We could find a statue of Buddha and the archives of holy books. During our visit, Czech Castle and Painting exhibition was held in the palace. At around 4 PM we were done visiting all the places for the day. We decided to go back to the hotel, rest for a while and then go shopping!! The idea was to buy stuff which is not found in Bengaluru. I bought embroidered tee-shirts, shawls, woollen caps and a Kashmiri salwar kameez suit. Did some bargaining and got it for a good deal. That was all for Day 4, which was pretty relaxing. 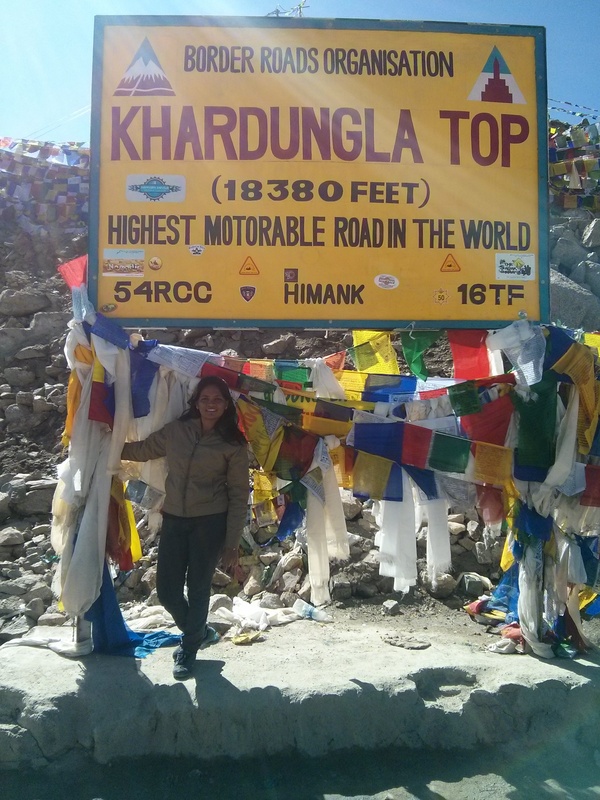 Be Mr. Late than Late Mr.
Day 5 (11 July 2014): We started at 6:30 AM to the world’s highest motorable road Khardung La! 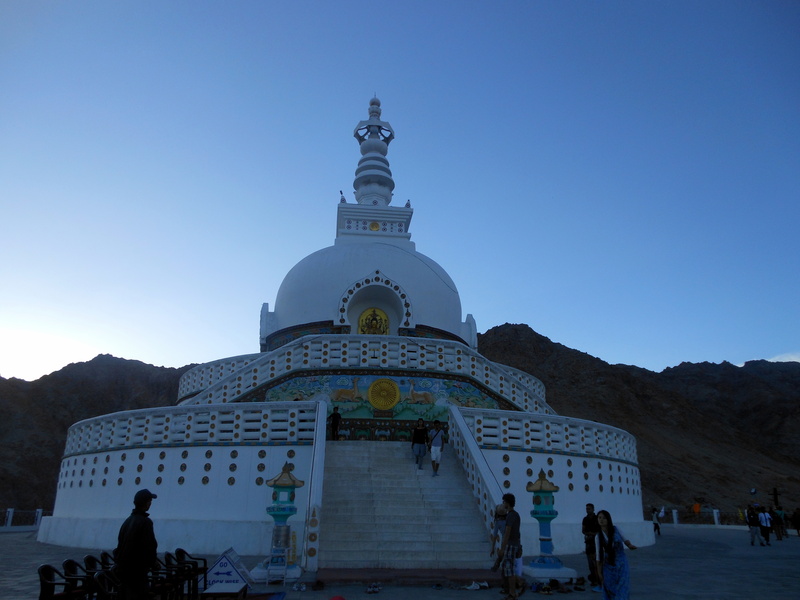 Honestly, we were apprehensive after the Chang La experience, given the fact that Khardung La is at an altitude of 18380 feet (around 1000 feet more than Chang La). While almost half of the group stayed back at the hotel and decided to go to Kalachakra, I was determined to check Khardung La off my bucket list. We could find Indian army deployed at the pass. Few got photographs clicked with the soldiers, I wasn’t lucky enough. In the whole of Ladakh, I think K top was the coldest place. I could see my breath! Just 10 minutes up there, it started getting really cold, my hands started freezing. Few felt dizzy, and that’s when we left. Roads weren’t that great, just like the roads leading to Pangong. The terrains had surprised us yet again! My respect for the cheerful chauffeurs of Ladakh. Never did I once see them low-spirited. Before noon we were back at the hotel. We had the rest of the day for ourselves. We ate, shopped, slept, packed and were ready to bid adieu to Leh. Mission Ladakh was accomplished. A major check off of my bucket list! Feeling accomplished and longing to get back home at the same time, we boarded our flight back to Delhi on July 12. 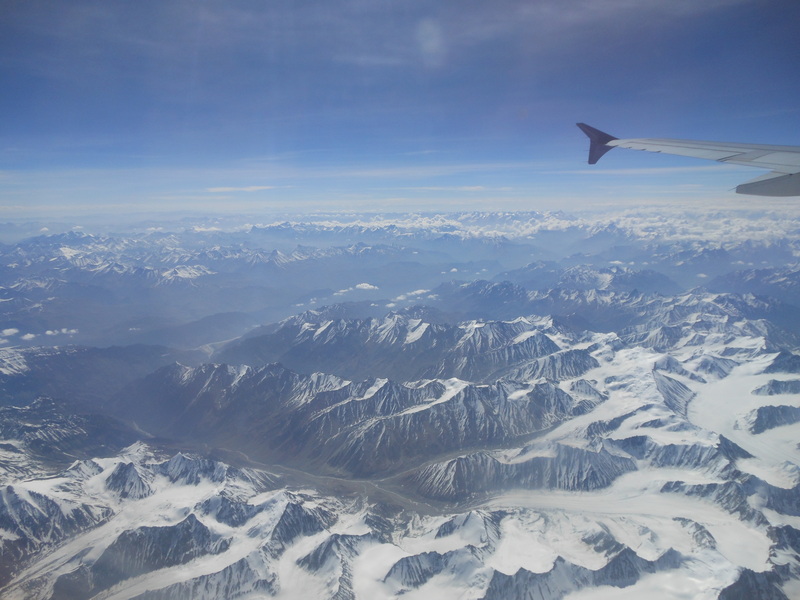 The last glimpse of the mighty Himalayas from the aircraft.